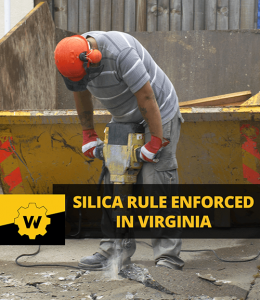 A Virginia-based construction company has been issued five citations for crystalline silica-related violations. According to Bloomberg Environment, the proposed fines, totaling $304,130, could be the largest fines to date under the new silica rule. Three of the five violations against the company are considered willful-serious, which carries a hefty fine. The controversial crystalline silica rule took effect on June 23, 2016 — after which industries had between one and five years to comply. The construction industry’s compliance date was Oct. 23, 2017. The rule most notably lowered the permissible exposure limit, required dust controls and safer work methods, and required employers to provide respirators to workers when other safe work methods were unable to limit exposure. The company did not ensure that each affected employee had proper eye or face protection when exposed to flying particles while operating or observing a jackhammer used to remove concrete. Employees were given sunglasses that were not approved eye protection.This violation is listed as serious. Employers are required to train employees so that they are fully aware of the hazards of their work environment and how to avoid exposure. The following hazards are required to be addressed: Cancer, lung effects, immune system effects, and kidney effects. This violation is listed as serious. The company failed to fully and properly implement engineering controls, work practices, and respiratory protection specified for the task of removing concrete with jackhammers. This violation is listed as willful-serious. The company did not assess the exposure of employees who were reasonably expected to be exposed to respirable crystalline silica. This violation is listed as willful-serious. Employees who were working in an environment exposed to respirable crystalline silica had not been given medical evaluations or clearance. Their respirators had not been properly fit-tested and workers had facial hair that did not comply with OSHA standards. These five penalties total $304,130 — all of which could have been prevented with silica exposure control methods and medical surveillance testing. Are you working with silica? Does your job site fall within the parameters of OSHA’s new silica rule? You shouldn’t have to wonder whether or not you’re in compliance when OSHA inspectors show up on site. You also shouldn’t have to send your workers to an urgent care clinic for testing when it can be brought to you, when you need it. With Worksite Medical, you can get convenient, OSHA-compliant medical testing, such as silica, respirator fit, and audiometric testing, on your job site and around your team’s schedule. Our mobile medical units are equipped with all the resources of a lab, and staffed with knowledgeable medical technicians who will get your workers in, out, and back to work. Keep your team safe and your workplace OSHA compliant without sacrificing productivity.